If you're planning a Yosemite vacation, these resources will help you plan your trip like a pro. Yosemite National Park is in the Sierra Nevada Mountains, on the east side of California. Almost due east of San Francisco, it's a four-hour drive from there and about six hours' drive from Los Angeles. All the ways to get there are summarized in this guide to how to get to Yosemite. Yosemite's heart is a glacier-carved valley. Soaring granite monoliths, cliffs, and waterfalls surround you - and a river runs through the middle of it all. Mile for mile, it offers some of the most spectacular scenery you're likely to see anywhere. Fodors says it best: "By merely standing in Yosemite Valley and turning in a circle, you can see more natural wonders in a minute than you could in a full day pretty much anywhere else." Elsewhere in the park, you'll find groves of giant sequoia trees, high mountain meadows and panoramic views of the mountains and valleys. 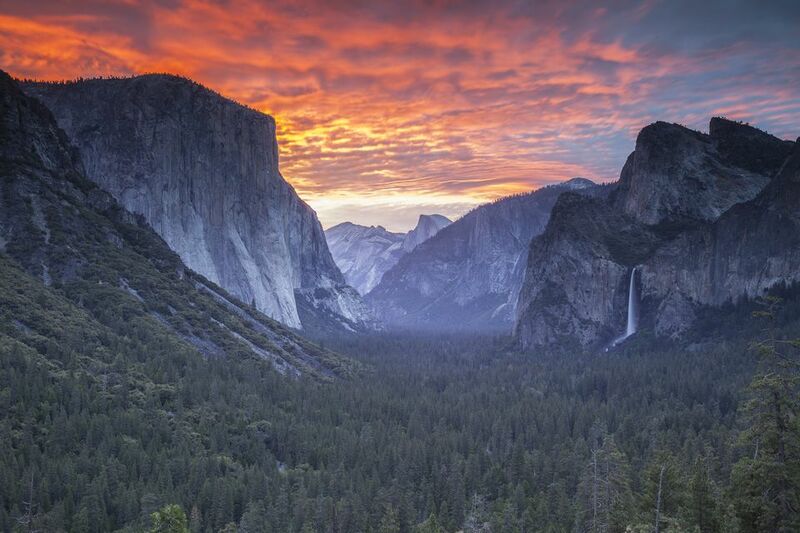 Tripadvisor reviewers rate Glacier Point, Half Dome, Tunnel View and Sentinel Dome 5 out of 5 in hundreds of reviews. Yosemite Valley ranks slightly lower at 4.5. A few of their comments: "If you love nature Yosemite is a must see." "I can not wait to get back to Yosemite." "Yosemite was everything I was expecting it to be - so majestic." Visitors go to Yosemite National Park for the natural beauty and outdoor recreation. You don't have to be a hyper-fit backpacker to enjoy it. There are plenty of things to see on short, easy hikes or even from the windows of your automobile. Families also enjoy taking the kids there. You can get a nice look around in just one day. To make the most of such a short visit, use the guide to one day in Yosemite. If you can stay for a weekend, try the Yosemite weekend getaway planner. If you only plan to do a few hikes and drive around to see the sights, three days is enough to see most everything. If you'd like to linger, you'll have time to enjoy more ranger-led activities, attend evening programs, take tours and hang around enjoying the scenery. Yosemite Valley: Sights include El Capitan, Half Dome, Bridalveil Fall, Yosemite Falls and the visitor center is here. You'll find two hotels here, a campground and tent cabins. Wawona and the Mariposa Grove: There's a classic hotel (now called the Big Trees Lodge), and the biggest and most easily accessible grove of giant sequoia trees is nearby. Tuolumne Meadows and Tioga Road: Drive east through the park going east on CA Highway 120 takes you through a high mountain meadow and the Tioga Pass. You'll get some excellent views along the way at Olmstead Point and Tenaya Lake. Hetch Hetchy: Accessed by a separate entrance from the rest of the park, Hetch Hetchy's main feature is a lake, created as a water supply for the city of San Francisco. The non-profit group Yosemite Conservancy restores trails and lookouts and protects habitat and wildlife. Get a membership before you go and you'll not only support their work, but you'll also get a bunch of discount coupons that will save you money on lodging, food, and activities. Visit their website to find out more.